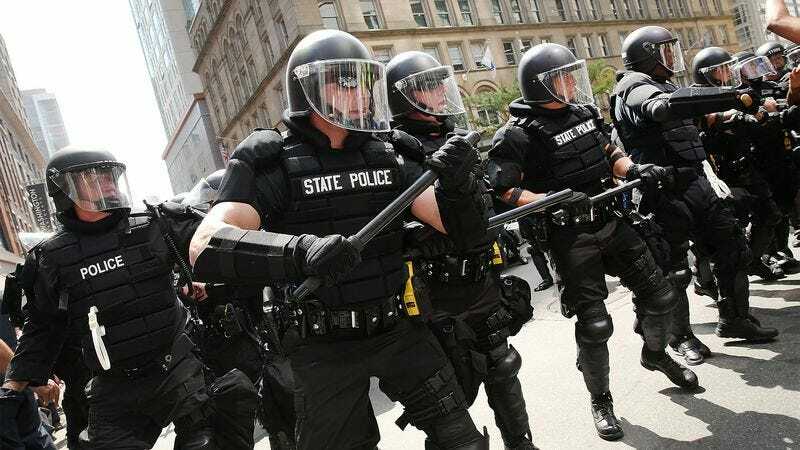 PHILADELPHIA—Quickly turning what had been an orderly demonstration into a violent melee, a peaceful protest Friday was reportedly interrupted by a swarm of aggressive, black-clad militants. According to bystanders, the protesters had been marching and chanting without incident when they were suddenly set upon by the hostile militants who wielded blunt weapons and concealed their faces. Those who witnessed the event stated that the unprovoked aggressors seemed to have arrived planning to engage in some sort of violence, as evidenced by their protective padding and combative demeanor. Sources also confirmed that several of the militants surrounded an unarmed protester and severely beat him, and that some of the attackers also used slurs and threatening rhetoric while disrupting the peaceful march. At press time, outraged community members were demanding to know why none of the militants had been arrested.